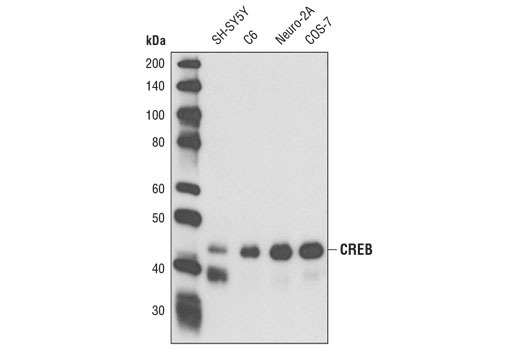 Western blot analysis of extracts from various cell lines using CREB (D76D11) Rabbit mAb. Confocal immunofluorescent analysis of mouse brain using CREB (D76D11) Rabbit mAb (green) and β3-Tubulin (TU-20) Mouse mAb #4466 (red). 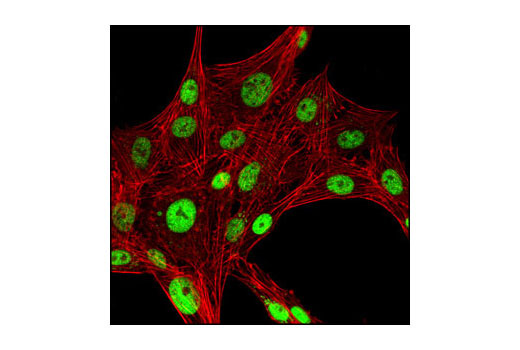 Confocal immunofluorescent analysis of SH-SY5Y cells using CREB (D76D11) Rabbit mAb (green). Actin filaments have been labeled with DY-554 phalloidin (red). Flow cytometric analysis of SH-SY5Y cells, using CREB (D76D11) Rabbit mAb Antibody (blue) compared to concentration matched Rabbit (DA1E) mAb IgG XP® Isotype Control #3900 (red). Chromatin immunoprecipitations were performed with cross-linked chromatin from 293 cells treated with Forskolin #3828 (30 µM) and either CREB (D76D11) XP® Rabbit mAb or Normal Rabbit IgG #2729 using SimpleChIP® Enzymatic Chromatin IP Kit (Magnetic Beads) #9003. The enriched DNA was quantified by real-time PCR using human ALS2 exon 1 primers, SimpleChIP® Human Nr4A3 Promoter Primers #4829, and SimpleChIP® Human α Satellite Repeat Primers #4486. The amount of immunoprecipitated DNA in each sample is represented as signal relative to the total amount of input chromatin, which is equivalent to one. For optimal ChIP results, use 5 μl of antibody and 10 μg of chromatin (approximately 4 x 106 cells) per IP. This antibody has been validated using SimpleChIP® Enzymatic Chromatin IP Kits. 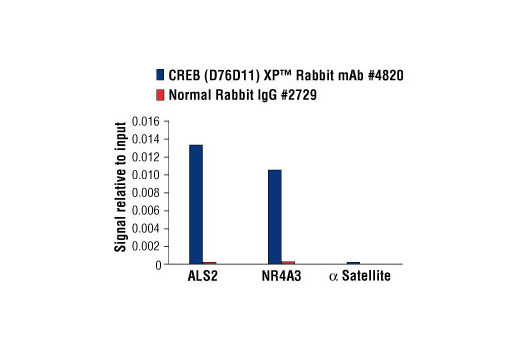 CREB (D76D11) Rabbit mAb detects endogenous levels of total CREB-1 protein. 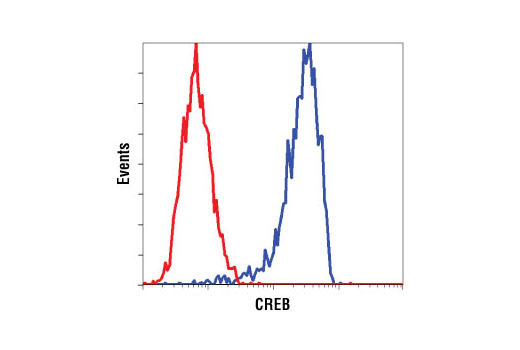 The antibody does not cross-react with other ATF/CREB family members. 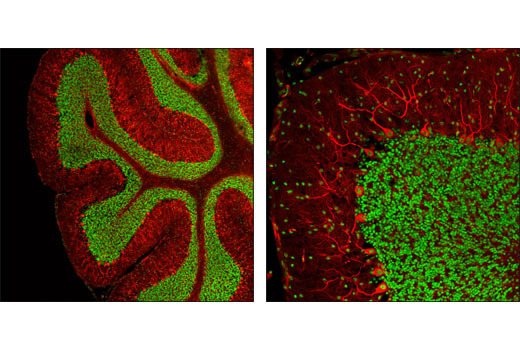 Monoclonal antibody is produced by immunizing animals with a full length GST-CREB fusion protein. CREB is a bZIP transcription factor that activates target genes through cAMP response elements. CREB is able to mediate signals from numerous physiological stimuli, resulting in regulation of a broad array of cellular responses. While CREB is expressed in numerous tissues, it plays a large regulatory role in the nervous system. CREB is believed to play a key role in promoting neuronal survival, precursor proliferation, neurite outgrowth, and neuronal differentiation in certain neuronal populations (1-3). Additionally, CREB signaling is involved in learning and memory in several organisms (4-6). CREB is able to selectively activate numerous downstream genes through interactions with different dimerization partners. CREB is activated by phosphorylation at Ser133 by various signaling pathways including Erk, Ca2+, and stress signaling. Some of the kinases involved in phosphorylating CREB at Ser133 are p90RSK, MSK, CaMKIV, and MAPKAPK-2 (7-9). Lonze, B.E. et al. (2002) Neuron 34, 371-85. Lee, M.M. et al. (1999) J Neurosci Res 55, 702-12. Redmond, L. et al. (2002) Neuron 34, 999-1010. Dash, P.K. et al. (1990) Nature 345, 718-21. Yin, J.C. et al. (1994) Cell 79, 49-58. Guzowski, J.F. and McGaugh, J.L. (1997) Proc Natl Acad Sci USA 94, 2693-8. Xing, J. et al. (1998) Mol Cell Biol 18, 1946-55. Ribar, T.J. et al. (2000) J Neurosci 20, RC107. Tan, Y. et al. (1996) EMBO J 15, 4629-42.